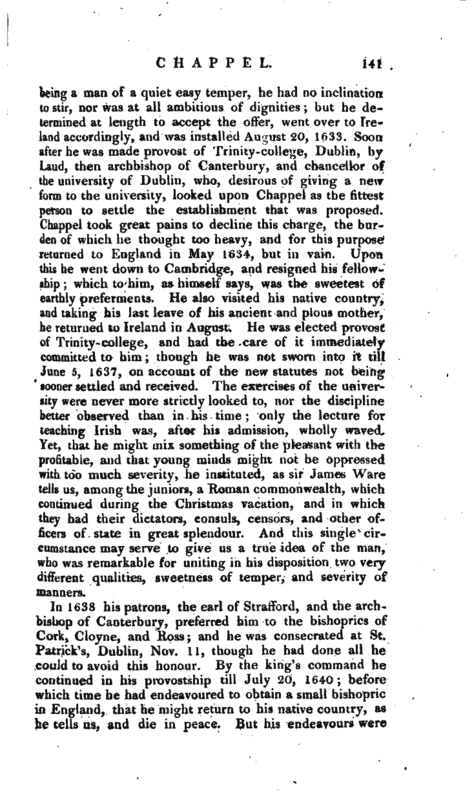 It is probable that he would have spent his days in college, if he had not received an unexpected offer from Laud, then bishop of London, of the deanery of Cashel, in Ireland; which preferment, though he was much disturbed at Cambridge by the calumnies of some who envied his reputation, he was yet very unwilling to accept. For | being a man of a quiet easy temper, he had no inclination to stir, nor was at all ambitious of dignities; but he determined at length to accept the offer, went over to Ireland accordingly, and was installed August 20, 1633. 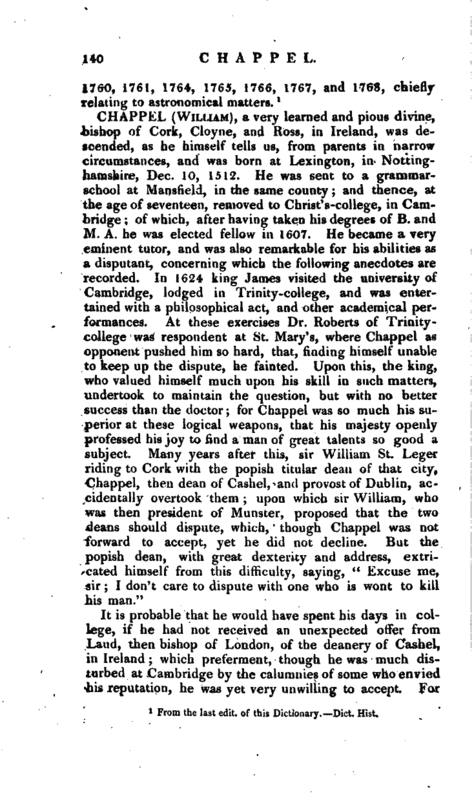 Soon after he was made provost of Trinity-college, Dublin, by Laud, then archbishop of Canterbury, and chancellor of the university of Dublin, who, desirous of giving a new form to the university, looked upon Chappel as the fittest person to settle the establishment that was proposed. Chappel took great pains to decline this charge, the burden of which he thought too heavy, and for this purpose returned to England in May 1634, but in vain. Upon this he went down to Cambridge, and resigned his fellowship; which to him, as himself says, was the sweetest of earthly preferments. He also visited his native country, and taking his last leave of his ancient and pious mother, he returned to Ireland in August. 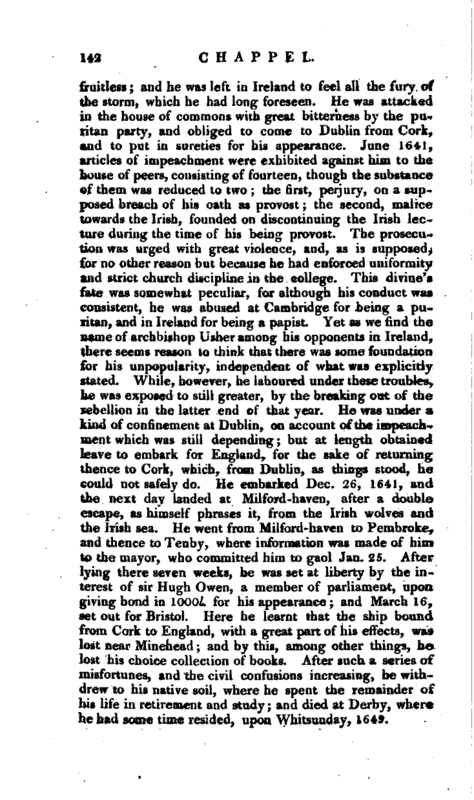 He was elected provost of Trinity-college, and had the care of it immediately committed to him; though he was not sworn into it till June 5, 1637, on account of the new statutes not being sooner settled and received. 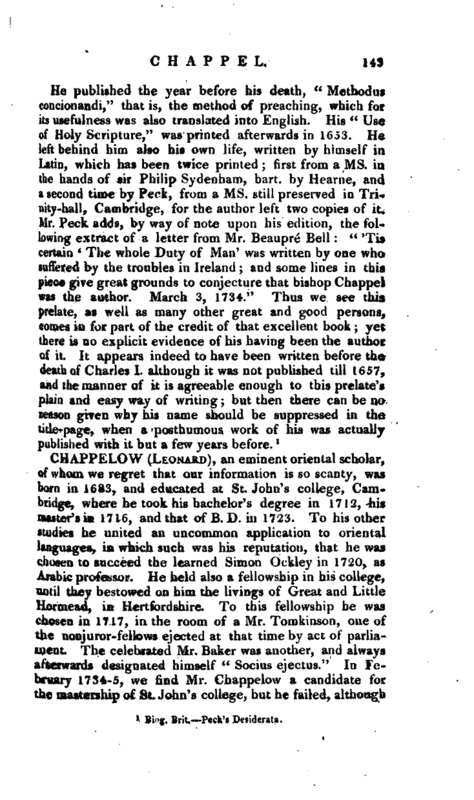 The exercises of the university were never more strictly looked to, nor the discipline better observed than in his time; only the lecture for teaching Irish was, after his admission, wholly waved. Yet, that he might mix something of the pleasant with the profitable, and that young minds might not be oppressed with too much severity, he instituted, as sir James Ware tells us, among the juniors, a Roman commonwealth, which continued during the Christmas vacation, and in which they had their dictators, consuls, censors, and other officers of state in great splendour. And this single circumstance may serve to give us a true idea of the man, who was remarkable for uniting in his disposition two very different qualities, sweetness of temper, and severity of manners.